When you enter Basso Café you feel transported to a warmer climate with the vibrant colors and art of the Mediterranean. The green walls are adorned with large colorful paintings depicting various culinary delights and the dark wood tables are inviting and offer a calming respite from the hustle and bustle of the day. At the helm of the Basso Café is Owner / Chef Renato Donzelli who is proud that his dream still thrives after opening at the worst possible time at beginning of the financial crisis in September 2007. He very much appreciates all of the favorable word of mouth recommendations that allowed him to weather the crisis. Born in Venezuela and raised in Naples, Italy, Chef Renato’s cuisine focuses primarily on Mediterranean flavors with a Venezuelan influence. The appetizers at Basso Café include options from Arepas and Empanadas to Bruschetta di Parma on crostini to Fried Yuca, while entrée selections include several fish, meat and poultry selections, plus several pastas. 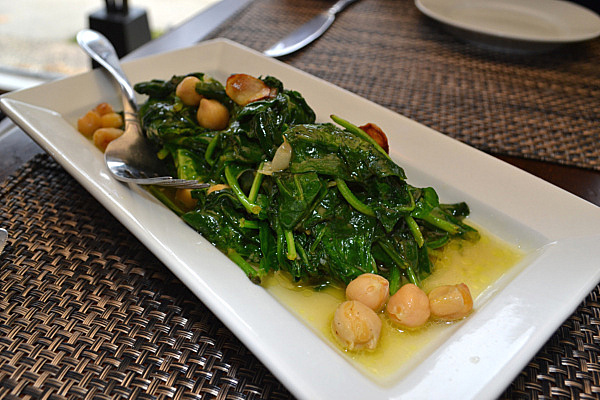 The highlight of the tapas / appetizers that we sampled was the sautéed spinach and chick peas with shaved garlic and olive oil. The spinach was flavorful and was complemented by the chick peas and Chef Renato elevated the brightness and flavors of the dish with a touch of lemon. 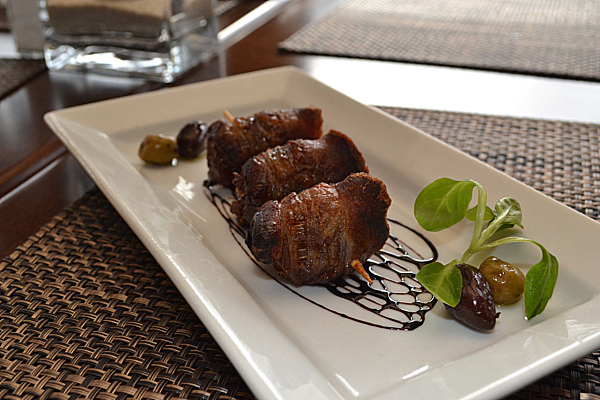 The Medjool dates stuffed with Formaggio Capra cheese and wrapped with smoked apple wood bacon were flavorful while the Mozzarella wrapped in applewood-smoked bacon and served with apricots and an apricot-caramel sauce offered various textures. 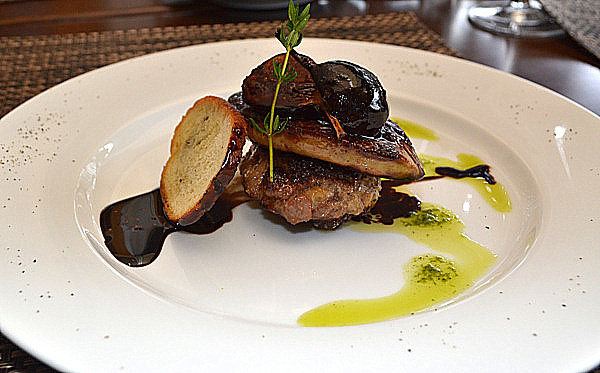 One of the current appetizer specials includes a slice of seared Foie Gras sitting atop a house-made duck and pork sausage and topped with a fig, white truffle oil and surrounded with droplets of chive oil. 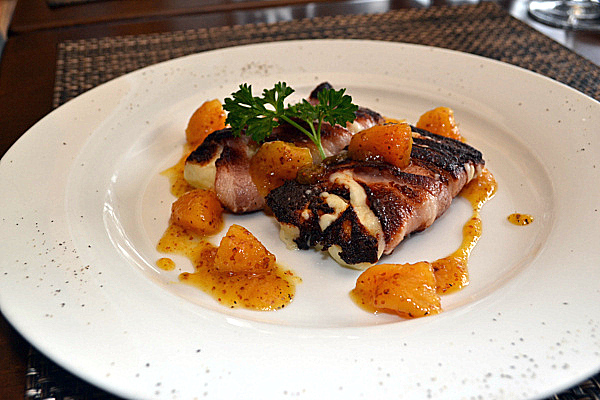 This savory dish delivers the full flavors of the various components but would benefit from a touch of sweetness to further enhance the richness of the Foie Gras. We also enjoyed two entrées. The seared Halibut sat atop baby Italian eggplant filled with caponata and served with a Romanesco sauce and topped fried strands of leeks. 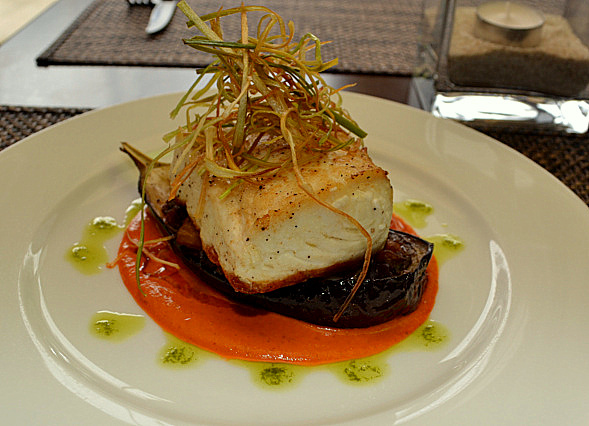 The dish was delicious, the mild flavor of the halibut worked well with the eggplant and caponata and further enhanced by the boldness of the tomato and pepper sauce. 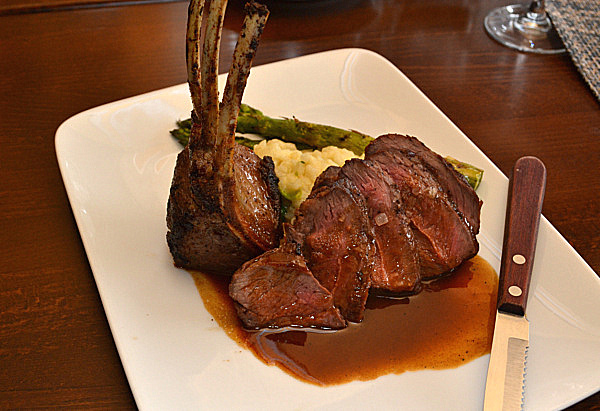 The “Lamb Two Ways” included three lamb ribs plus several slices of roasted leg of lamb served with Parmesan and green pea risotto plus several grilled asparagus. The lamb chops were perfectly cooked to maintain a pink interior while the sliced leg of lamb was served to medium doneness. We very much enjoyed its deep and rich flavor. Likewise the risotto was served to my preference of just short of al dente while the Parmesan cheese created a luscious and creamy finish. Of the three desserts we sampled, we highly recommend the Tres Leches cake and the Tiramisu. The vanilla cake was soaked in three kinds of milk and subsequently drizzled with caramel. The cake was soft and flavorful and the three toppings added a sweet component to the dish. The Tiramisu was wonderful with Savoiardi biscuits that were softened by soaking in espresso, and then layered with whipped mascarpone and topped with bittersweet chocolate. This was a delightful version of the Italian classic dessert and was soft, flavorful and the addition of the Venezuelan cocoa atop the dish was delicious. These two were delicious choices to complete the meal. A more mild dessert was the Berry Napoleon that included several types of berries within three layers of cookie plus lemon curd. The dessert was good, but we found the full flavors of the other desserts a better ending to the meal. With numerous appetizers and tapas to choose from, share several with friends and family and then enjoy one of the entrees, but leave room for one of the sweet recommended desserts. 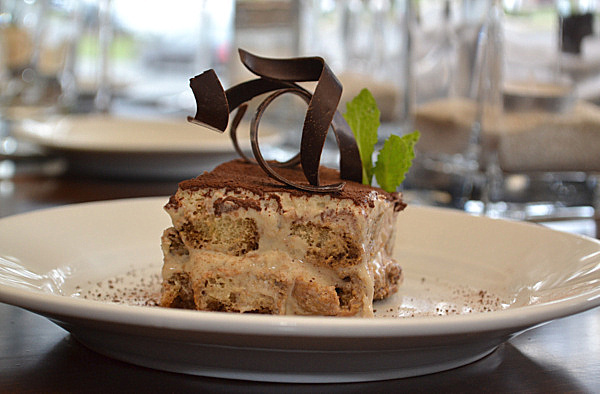 4) Tiramisu – Savoiardi biscuits dipped in espresso, layered with whipped mascarpone and topped with bittersweet chocolate. 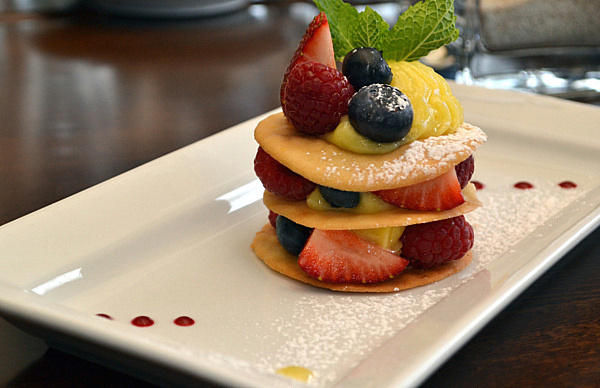 3) Berry Napoleon Fresh berries and Lemon Curd. I have been wandering in and out of Bar Rosso since it opened, and wrote a few reviews for http://www.ctbites.com. Then I tried a hamburger and similar to previous attempts my medium-rare order arrived well done. Totally ruined a good piece of meat. So I would also move this to the do not order category. On a positive note the pizza dough is still excellent, but the previous pizza maker from Italy has moved on and the overall pizza is still good, but not as good as previously. Since I work in the area I visit Letizia for take-out pizza…and it is a good take out pizza. WIth few choices in the area, this is better than average pie, but the amount of toppings they place on the pie are just too heavy for the crust. Would I want them to reduce the toppings? nope, but they need to redo the crust to allow for someone to actually pick up a slice. If you are not adverse to using a knife-fork for eating pizza, not a problem, but for us old timers who like to raise the triangle and bite, this is a tough pie. 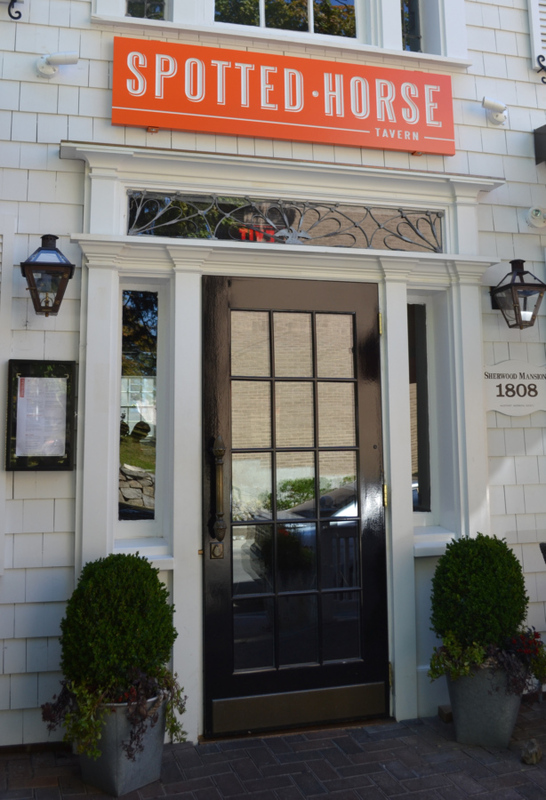 Let’s gut a 200+ year old building, decorate the interior with reclaimed woods and discarded farm items, build a U-shaped bar and serve organic tavern cuisine, nestle it amongst high-end retail shops in downtown Westport, CT and name it The Spotted Horse Tavern. Sound like a plan? Sure why not? Enter seasoned Fairfield County restaurateurs Kevin McHugh, Pete Menonna, Tommy Febbraio, and George E. O’Connell. They purchased and updated an early-1800s building to give a farm country atmosphere thanks to the wide rough-cut planks on the floors and walls made of reclaimed barn siding—one adorned with a large double gate that McHugh found during his travels. 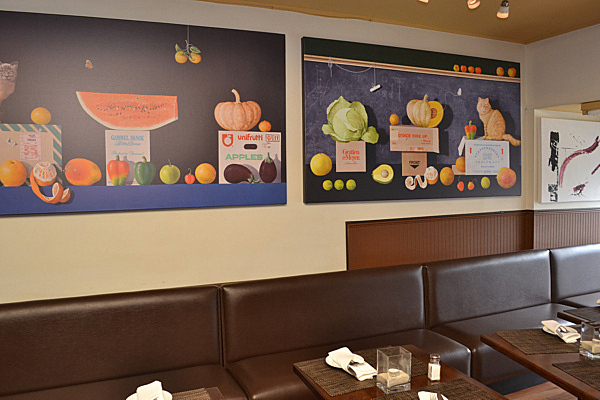 Overlooking the dining area are large photographs of the restaurant’s namesake spotted horses. On any night the bar area’s five tables and 15 stools bustle with 30-somethings, while the dining area’s 50 seats host a full demographic mix. The menu offers a wide variety of organic choices from sandwiches and salads to roasted meats and poultry. 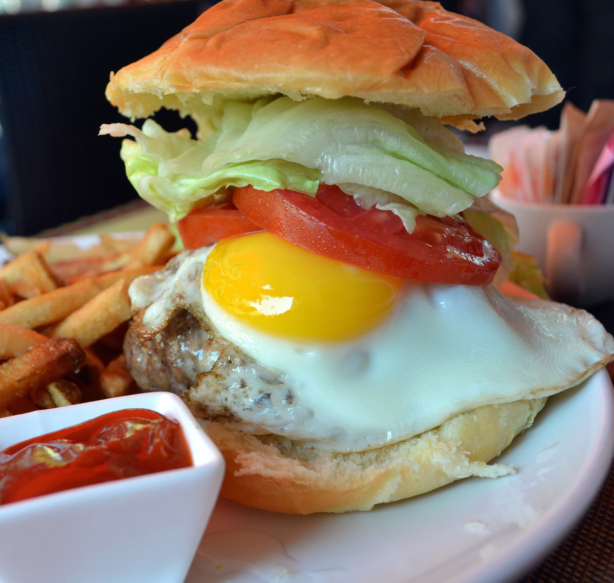 For burgers they offer the basic Grass Fed Angus Burger, an eight-ounce patty with lettuce and tomato ($11.95), plus the Black Truffle Burger ($13.95), which includes caramelized onions, black truffle butter, a sunny-side up egg, Bel Paese cheese, lettuce, and tomato. You can add toppings for $1 each. I added bacon and American cheese to my Grass Fed Angus Burger. The Spotted Horse purchases its meat from Saugatuck Craft Butchery, a local butcher known for its high quality organic beef. The half-pound, 19 percent fat patties are composed of coarse ground short rib, chuck, and sirloin. They’re seasoned with a touch of salt and pepper and are hand-pattied immediately before being grilled on the indoor gas-fired grill. The highlight of the burgers is the incredible meat; it’s one of the most flavorful patties I’ve ever tasted; deep and rich. 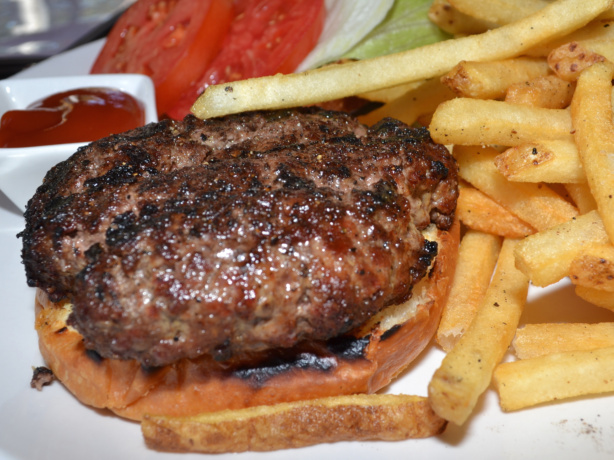 The well charred patties are slightly crisp on the outside, while the interior offers a slightly hand-pressed texture. When cut in half the meat releases just a bit of juice, which the bun easily absorbs. This may be my new standard for the taste of a good burger patty. 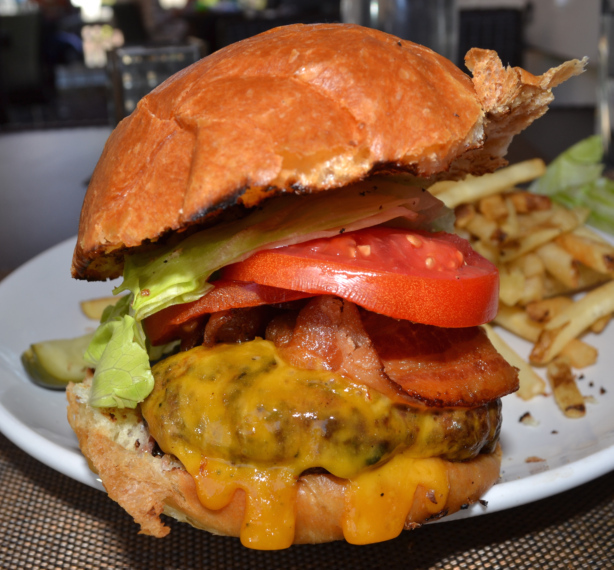 The Spotted Horse’s bacon is excellent; several rashers of thick and crispy hickory-smoked bacon add a good amount of smoky-saltiness to the Grass Fed Angus Burger. (Make sure that it actually arrives with the hamburger, as I was zero for two in my visits. In each case the server ran to the kitchen and brought the bacon on a small plate, leaving me to build-my-own bacon burger when I’d rather receive it already built.) The substantial amount of American cheese (also missing on one occasion) is melted and creamy, although it adds nothing to the overall flavor. 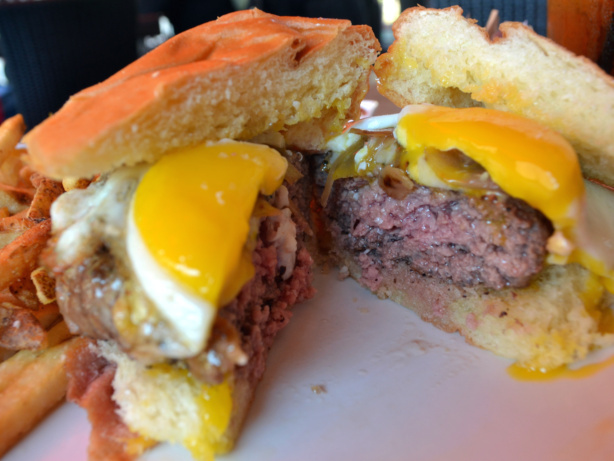 The sunny-side up egg on the Black Truffle Burger is great. The firmness of the fried egg white contrasts well against the meat and the oozing yolk adds an incredible lusciousness. The small amount of Bel Paese cheese is, like the American cheese, well melted and creamy but is just too mild. The “caramelized onions”—as described on the menu—aren’t luscious, soft, and sweet, but are, to my disappointment, crunchy and overly pungent. They’re better described as grilled. Likewise the black truffle butter doesn’t enhance the overall flavor. 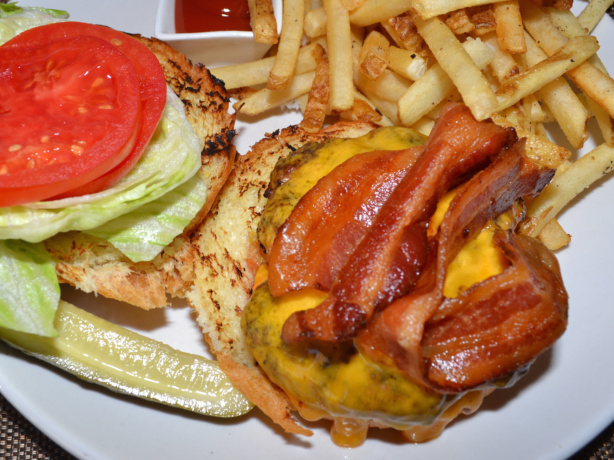 The burgers are encased in brioche buns from Billy’s Bakery in Fairfield. The buttery, sweet buns contrast well against the beef’s rich flavor, but again, consistency is an issue. The bun on my bacon cheeseburger was thick and round while the bun on my Black Truffle Burger was crushed, almost as if a plate was placed on top. Likewise, on some occasions it arrived toasted (my preference and the preference of the owners), while on another it arrived untoasted. I’m told that the kitchen is working on consistency in all of these areas. The accompanying skin-on shoestring fries were perfectly fried to a crispy exterior and a soft and moist interior. They were delivered salted and piping hot with a little cruet of ketchup. 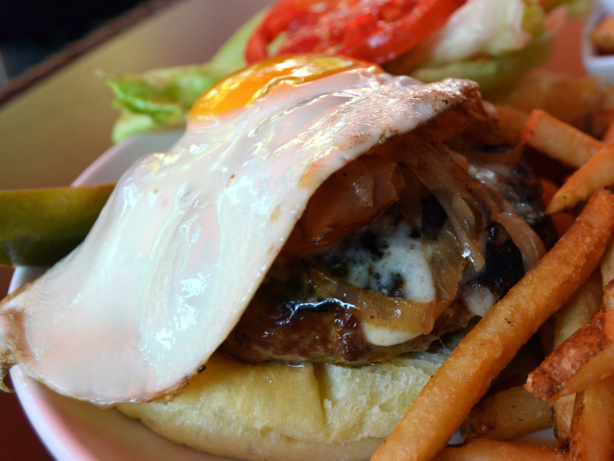 Consistency aside, The Spotted Horse serves a richly flavored hamburger with some great toppings in a relaxed, yet vibrant atmosphere. If you order the appropriate toppings, and check carefully that your hamburger arrives as ordered, this is a great destination for the hamburger lover.